The MDX has been a popular SUV since its introduction in 2001. The MDX provides a luxury car feel with excellent ride, maneuverability, and a cabin that is roomy and comfortable for up to seven passengers. 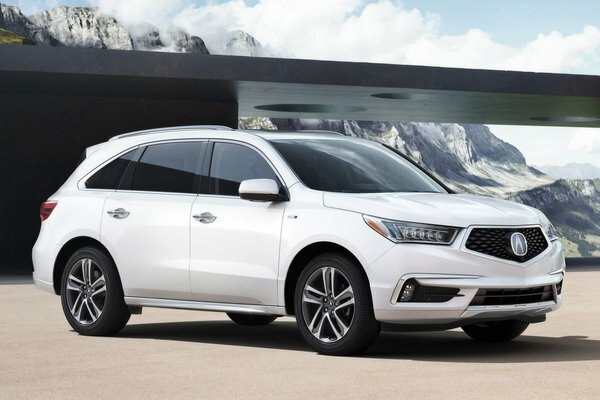 The MDX is now offered in FWD, AWD, and Sport Hybrid models. Most MDX models equip a 3.5l V6 engine and 9-speed automatic transmission. A newer Sport Hybrid model equips a hybrid gas/electric drivetrain similar to that of the NSX. The Sport Hybrid system consists of a 3.0l V6 engine, 7-speed dual-clutch transmission and three electric motors powering all four wheels. The Acura Advance package adds uncommon features such as adaptive cruise control and a collision mitigation braking system. The Entertainment package adds a rear-seat DVD entertainment system and heated rear seats. With Honda's reliability and high resale values, the MDX is an all-around safe bet. The MDX wears revised styling for 2017. The MDX adds a Sport Hybrid model. Similar to the drive system in the new NSX, the MDX Sport Hybrid combines a 3.0l V6 engine with three electric motors for a total system horsepower of 321-bhp. This all-wheel-drive powertrain is rated at an estimated 26/27 mpg (city/hwy).